The answer to Leslie Ann Murray of the American Chamber of Commerce had been given and this article on the general background to De Dion-Bouton relating to the supply of commercial vehicles for the infamous Kennon Road in the Philippines Mountain Province had been forwarded to her. The conclusion was that her photos related to De Dion-Bouton vehicles not of 1908 but of those delivered after 1910 and that this was quite a few years after Kennon Road had been opened. It was also concluded that De Dion-Bouton vehicles were ordered because of their international reputation as reliable mass-transport vehicles, tried and tested in many capital cities and in the European Alps. So, - that was it; - end of story. Fascinating question about a long gone make of vehicle in a very far-away place. Done and dusted ! However, despite having given the answer to the specific question asked, I was left with one large nagging question. If Kennon/Benguet Road was completed in 1905/6, what, if anything, was used to transport the people from the base to Baguio City in the four years until 1910? The nagging continued as did the desire to fill the 'missing link'; - and so the research continued. (Shades of becoming an anorak!) Then a chance click on a Philippine website via a Philippine search engine found tucked away in amongst current information on a tourist company website about Baguio City, a short statement: " ...Beginning 1909, a government fleet of Stanley steam autos brought up more than 2,000 passengers a season." Now here was a turn-up for the books! We knew that a fleet of vehicles was used and that they were De Dions, so this surely had to be an error. Further research on Philippine sites produced no other mention of Stanley Steamers, and all further international web research on Stanley Steamers produced no mention of any of them having been used in the Philippines. So contacts were renewed with Leslie Ann to see if she had any further information. She confirmed the road was under construction in 1905 and there were problems in finishing it due to the final gradient being nearly a sheer wall. 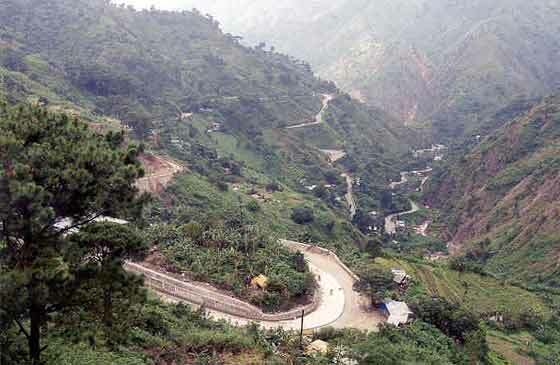 The road was originally called Benguet Road as it led into Benguet Province in the Cordillera mountains of Luzon, the chain of mountains in the centre of the island. She also confirmed that the road was eventually named after a Major Kennon the U.S. Army engineer who figured out how to get the road up the mountain by building the road in a zigzag up the incline (still formally known as the Zig-Zag). But nothing about Stanley Steamers. So I contacted the Stanley Museum in Kingfield, Maine, USA, and asked advice if they knew of any Stanleys having been supplied to the Philippines. 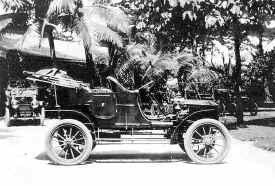 I was pleased to receive a reply from their Archivist Jim Merrick who advised that their records indicate that a "fleet" of Stanley steam cars was introduced into the Philippines during the administration of W. Cameron Forbes, the US Governor-General of the Philippines from 1909-1913. Stanley Museum however had no information on where these cars were deployed and were keen for further information. They provided a photo from their archives showing a pair of cca 1908/9 Stanley cars in service in the Philippines but they did not know where. The cars are both early Stanley nine passenger Mountain Wagons. 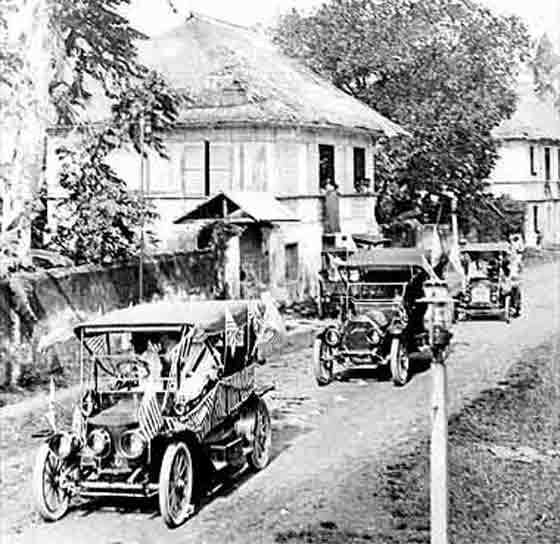 It was possible that man in the pith helmet was W. Cameron Forbes, and the car on the left had an intriguing address " B....sts and Philippine Islands" printed on the side. The 'where' bit was easy to determine. The 'colour' and the background of the mountains and the style of the road indicated that the photo could not have been taken anywhere else but Kennon Road. The photos of the De Dions in Part 1 of this article have an identical background. So it seems that Stanleys must have been up Kennon Road and must have carried multiple people. This exciting find was emailed to the Philippines for confirmation of location. This was confirmed as Benguet Road showing the southern flank of Mt. Santo Tomas in the background, with the cars having just climbed the steepest gradients of the ZigZag. In the meantime Leslie Ann had been doing her own researches back in the Philippines and had contacted Jim Halsema who was the son of the Mayor of Baguio between 1920 and 1937. Jim is a former news correspondent, historian and writer/lecturer, now retired and living in the USA. Jim started delving through his records and with the assistance of his colleague Erlyn Alcantara they were able to provide some interesting answers. It seems that the main proponent for the development of Baguio City into the official hot season capital of the Philippines was William Cameron Forbes. Forbes was born into one of the wealthiest USA families in Boston, went through Harvard and became a partner in the family business. Wealthy but bored, he originally came to the Philippines in 1904 as the member of the Philippine Commission for Commerce and Police, with responsibility for all government-sponsored construction. Here he discovered that Benguet Road had been built at enormous expense but to little effect because the area lacked facilities. He was therefore instrumental in the creation of the Baguio Country Club, encouraged the U. S. Army to establish Camp John Hay (as a rest and recuperation facility for military personnel in the islands, to avoid the long sea voyage home), and created the residence of the Governor General, naming it "The Mansion House" after the Forbes family summer home off Cape Cod. It seems that construction of Benguet Road by Major Kennon may not have been as much of a success as was made out at the time. It was enormously expensive and took nearly five years to complete and, having been built separately from both directions simultaneously, did not meet as expected. This resulted in the construction of the serpentiney 'ZigZag' which taxed the men and animals constructing it and limited the vehicles that could be used on it afterwards. It is said that while Cameron Forbes initially admired Kennon's work he seems to have changed his mind and quietly transferred Kennon out of the Philippines. The road was later named, and remains, 'Kennon Road' after Kennon, but not until 1921. Kennon/Benguet Road had been constructed using manual labour and with local bull carts and mule drawn wagons. On completion, the Bureau of Public Works began public transportation on Benguet Road by operating a horse and mule-drawn "stage coach line" familiar to viewers of Western movies. Very slow and cumbersome but relatively effective. In 1905 Cameron Forbes bought to Manila an Insular Architect together with a young Warwick Greene, son of the general who led American troops into Manila, as his assistant. Their duties were to implement the Burnham Plan of urbanising Baguio. Cameron Forbes took the opportunity to be one of the very first to build a residence on the highest plateau which the plan called "Topside". This house, called TipTop, became the centre of his life and symbolized his commitment to the new resort. Young Warwick Greene displayed such imagination, initiative and mechanical skills that Forbes put him in charge of all phases of creating the government centre of offices and residences for personnel transferred during the tropical summer months of March, April and May from Manila. One of Greene's first preoccupations was to transform the mule-pulled wagon line into an effective road transportation system to Baguio from a new spur of the Manila-Dagupan Railroad along the Benguet Road. Without this, the development of Baguio would not have been possible. Greene and the Bureau of Public Works were convinced that motorised vehicles would be necessary but the severity of the inclines limited the choice. There were some motorised vehicles in use in the Philippines including some steam propelled wagons. Some vehicles were used in other road construction projects including 'corduroy roads' where logs were laid horizontally over the earth, but for Benguet Road they would need something powerful and relatively quick. It seems the first choice had been Stanley Steamers, probably chosen because of their reputation as hill climbers. Stanley Mountain Wagons were designed to order and used for carrying passengers and freight to resorts in the White Mountains of New England and in the Rocky Mountains in the Western U.S. By this time, Cameron Forbes was Vice Governor, and year later became the Philippines Governor-General, remaining so until 1913. 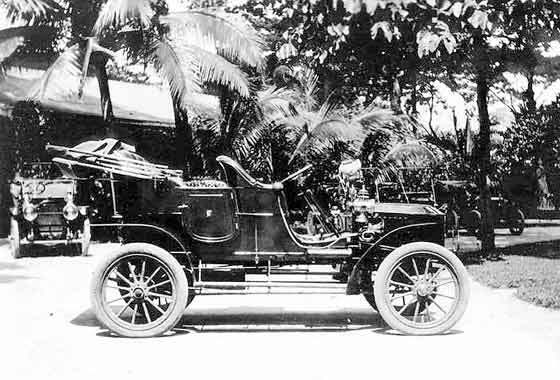 It is believed that Cameron Forbes may have influenced the choice of Stanley steam driven cars to be tried in the Philippines because he would have been aware of them as they were manufactured in the Boston area where his family home was located. What is certain, is that the Philippines Commission authorised the Bureau of Posts to order the first two Stanleys in 1908. These two Stanleys were operated by the Bureau of Posts and served two purposes; to provide mail services and to serve as an experiment for passenger services. The experiment proved successful. The savings derived from mail transportation augmented by the additional income from passenger service made it a highly favorable venture. This resulted later in 1908 in Warwick Greene ordering five eight-passenger Stanley automobiles for the Benguet Auto Line road service. It is believed that the actual order for the vehicles was placed by William Greene at the Stanley factory on one of his periodic visits to his home in Rhode Island. 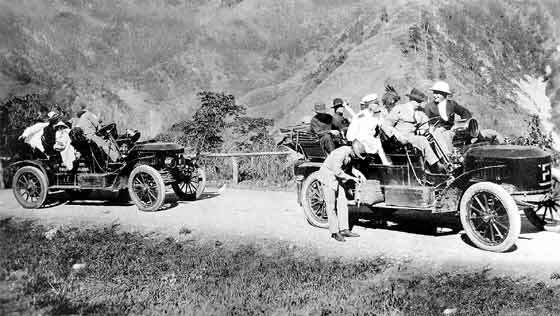 In March 1909 the Benguet Auto Line began serving Baguio-bound passengers with motorised transport. Passengers would transfer from the Dagupan railhead to a branch line that took them to the lower end of the Benguet Road at Camp One. Here the Stanleys waited to take the passengers and freight up Benguet Road and the ZigZag to Baguio. Armed with the above information, examination of the Stanley Museum photo starts to give up some of its secrets. The most likely date of the photo would be on the turn of 1908/9. The Wagon on the right was launched by Stanley in June 1908. Study of the writing on the left car, " B....sts, Philippine Islands", is now quite evidently Bureau of Posts. As the location is Kennon Road it can only be before the Benguet Auto Line took over. So the photo is probably of the first two original Stanleys sent to the Philippines. It has been suggested that the driver might be Warwick Greene with Forbes beside him in the pith helmet . The history of the Stanley Brothers and the development of the Stanley Steamers is well documented in the John F. Katz' article, "F.E. & F.O. Stanley: the Challenge from Steam," Automobile Quarterly 25:1, pp.14-29 (1987). A fascinating historical coincidence relating to this story according to the Stanley Museum is that the Stanley twins were seemingly inspired to design and build their own motor carriage in the summer of 1896 following their visit to the Brockton (Massachusetts) Fair. There they appear to have witnessed a less than impressive demonstration of an early 'internal combustion' French vehicle which broke down on the local race track. This vehicle is thought to have been an early De Dion-Bouton. According to legend, one of F. E. Stanley's companions asked him if he was going to buy one of the French cars, and he demurred, saying that he thought he could build a better one himself. The following year, in 1897, the first Stanley steam car made its road test. Stanley Museum subsequently found some more interesting photos in their archives relating to Stanleys in Baguio. The photo on the left is of a Stanley touring car. The street sign beside it states "Outlook Drive". Outlook Drive still exists in Baguio and leads to Baguio Country Club Road and onwards to Ambuklau Road, the road to 'TipTop', the Forbes former Baguio residence. The handsome car on the right is possibly a Model F Touring Car which has the monogram CF on the rear passenger door. This has all the appearances of having been Cameron Forbes' Governor General car. It seems that as many as 40 Stanley Steamers may have been introduced into the Philippines during the times of Cameron Forbes and William Greene. 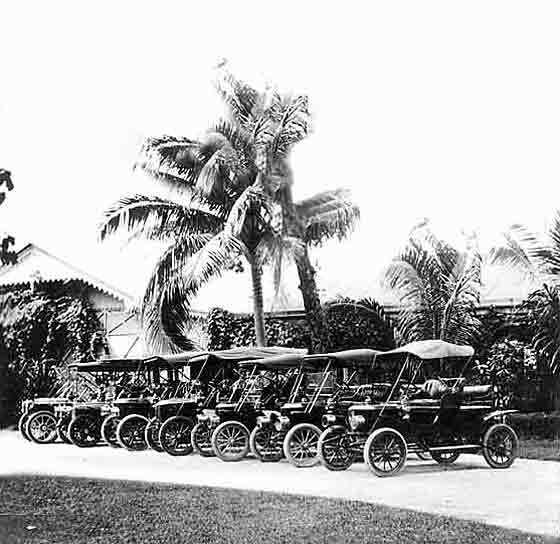 Certainly a photo from Stanley Museum shows a row of cars in Manila of which 5 are Stanleys of cca 1910. It is believed that some of these were used on other road construction programmes. The photo on the right from the Historical Collection, Ateneo de Manila University shows a Stanley of 1910 vintage bedecked with bunting and flags leading a car parade. A very faint handwritten date on the photo suggests July 1911, possibly US Independence Day? What is interesting to note from Jim Halsema is that by the mid 1920s, Stanleys seem to have disappeared from general use in Baguio. This may well have been because they required a lot of water, especially in difficult terrain, and that adequate supply of water has always been, and remains, a problem in the city. Stanley Brothers stubbornly resisted adding condensers to their cars until 1915 because they disliked adding weight and complexity. 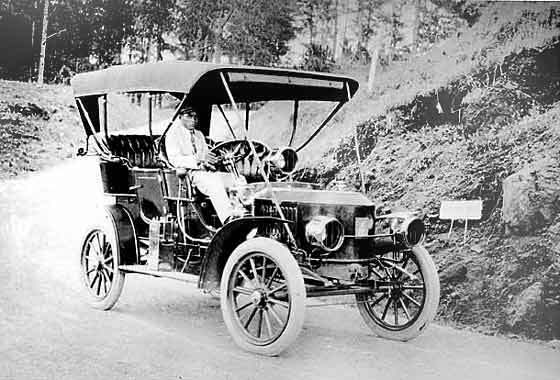 It seems that the Bureau of Public Works experiments with Stanley sedans during 1908-10 had proved the feasibility of mass transport by motor vehicles along the Benguet Road but it seems that the Stanleys were considered neither big enough nor powerful enough, so something larger had to be found. Records have now been found to show that this was the De Dion-Boutons already described in Part 1 of this article. The first fleet of eight De Dion-Bouton Busses for the Benguet Auto Line was ordered in 1910 by William Cameron Forbes. What is very pleasing from my own personal point of view was the confirmation of my assumption that the De Dion-Boutons could NOT have been delivered before 1910 and that something must have been used first, as indeed the Stanleys were. As a summary to this article, the following are some excepts from the journals of William Cameron Forbes, then acting Governor of the Philippines: (April 28, 1908) At Camp One we were met by [Director of Public Works Warwick] Greene, grim and grimy. He has been working himself to death to make this transportation plan a success. His different chauffeurs have failed him and, supported only by the ubiquitous Pedro, he has alone upheld the day, running three machines himself. Seven times over the road on Sunday is enough, and working at night besides. But he's turned the trick, and everyone is full of praise of his result. Twice since I've been here he's been up at 3:00 a.m. and kept nearly continuously at it until 1:00 a.m. the next morning, which is more than flesh and blood can stand, as the road isn't in too good condition, the bridges are pretty rickety, and I have arranged to have the suspension bridges all replaced with steel ones. The trip from Twin Peaks to Baguio is not infrequently made in an hour and ten minutes, and Sundays the crowd is fierce. There is a scramble for the machines and clamoring...when the many are left and the few steam out. We are figuring now on buying some large machines and running a better and more regular service next year. ... (March 11, 1909) Greene has got some splendid new machines for the Benguet road, three seats, three to each seat and he has gone up [to Baguio] to open the new service about a week ahead. It takes more skill to handle such a big machine on the road, and the Filipino drivers have to be trained to handle the new service. The new machines are a great success. They take two hours to a trip, although Greene has brought them down in one hour and ten minutes. A new device of brakes has done wonders in this respect--a series of wooden blocks that can be replaced as fast as worn down. It takes four minutes to put in a wholly new set. There are fine big garages at either end of the line. It looks like business, and people are much pleased. ..and some excepts from Philippine public records : (Fiscal year 1912: BPW, Baguio Division, Operation of the Benguet Automobile Line.) " During this year this line carried over 19,000 passengers without accident or injury to any of them. Considering the conditions under which this automobile service is maintained, this result is considered remarkable, and may be attributed to the strict discipline maintained, and to following railroad practice in running automobiles in trains and regulating the traffic by a regular block system, with passing points at the gates, gate-keepers and telephones. The main reliance of the line is placed on 18 trucks, of which 17 were specially built by the well-known De Dion-Bouton firm for service on the Benguet Road, and one by the same firm for use in Baguio as a bus. These cars have given splendid service, and leave nothing to be desired as passenger carriers. 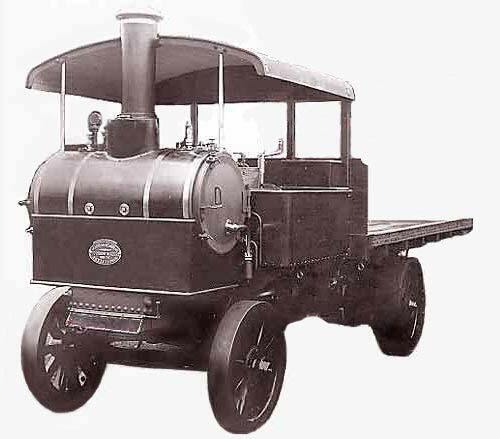 As freighters, however, they only carry 2 tons useful load, the design being limited to this load owing the fact that at the time the cars were ordered, the weight limits of the bridges on the Benguet Road was 6 tons, and the De Dion, with full load, driver, helpers, equipment, etc., weighed over 5 tons. The weight limits of the bridges on the Benguet Road has since been increased to 8 tons, and we are now contemplating the purchase of heavier motor trucks along somewhat different lines. During the year, 5,161 tons of 2,000 pounds each were carried under the direction of the automobile line, for the greater part by the De Dion trucks, although a portion by bull carts and mule teams. A new garage was built near the electric light plant. (Quarterly Bulletin, Bureau of Public Works Jan. 1, 1913.) Extract from Japan Advertiser, Tokyo, Japan, of a tour of the world made by Mr. Melvin A. Hall of New York : " With the exception of a few mountain trails the Benguet Road furnishes the sole communication with Baguio, and everything from first-class passengers to building material that enters or leaves the summer capital is carried by the most remarkable automobile service in the world. A train of high powered De Dions running on a railroad schedule, makes the return trip daily from Baguio to Camp One, connecting with the Manila trains. When, as at the time of my visit, the branch railway line to Camp One was washed out, the motors go 25 miles further to Dagupan and back, making the round trip nearly 100 miles. We pulled away from Camp One with our regular place in the train and ran up the narrow Bued River Canyon, while a little white tag bearing our number moved on its own wire across the huge score board in Baguio, which keeps track of every vehicle on the road..."
(Excerpt from: Erlyn Ruth Alcantara, "Building the Benguet Road," ms, October 1998.) Sample schedule of a trip from Manila to Baguio at around 1912: " Leave Manila on board the narrow-gauge European-style train of the Manila Railroad Company at 8 am, served breakfast and lunch aboard the dining car. After a hot and dusty trip, reached the Dagupan railhead at 1:30 pm. Changed to a branch line at San Fabian for Camp One. From the station at Camp One, transferred to a passenger motorbus of the Benguet Auto Line for a slow three hour climb on the narrow Benguet Road, stopping every now and then to wait for the "down" traffic to receive dispatches on the road ahead." So there you have it; all i's dotted and t's crossed. The end of the story? Surely? Would be, - but for the little snippet: (Annual Report of the Director of Public Works – July 1, 1913-Dec. 31, 1914) The automobile equipment assigned to the Baguio office included the 18 De Dion cars with 4 trailers and 8 Yorkshire steam wagons with 4 trailers....."
Yorkshire Steam Wagons? Oh no! What are these, ..and what were they doing in the Philippines? As this article is getting overlong anyway, I will leave others to do the research on the Yorkshire, and the 'why'. I can, however, give them a start by saying that Yorkshire Steam Wagons were manufactured in Hunslet, Leeds, in the county of Yorkshire in England. So how come English steam lorries found their way to the Philippines? Well it could have something to do with the fact that the British owned the Manila Railroad ! In January 2019 we were contacted by Karen A. McClure who advised: "My mother, Dorothy Robertson Arwe, received a call last weekend from an individual who maintains a Stanley Steamer registry. This gentleman, Kelly Williams, has a photo of my grandfather, Ellis Robertson, in one of the SS's that was owned by our family - photo was taken in 1955 at a SS event in Lakeville, Connecticut. According to Mr. Williams, this vehicle is now owned by the Automobile Museum in Tallahassee, FL. 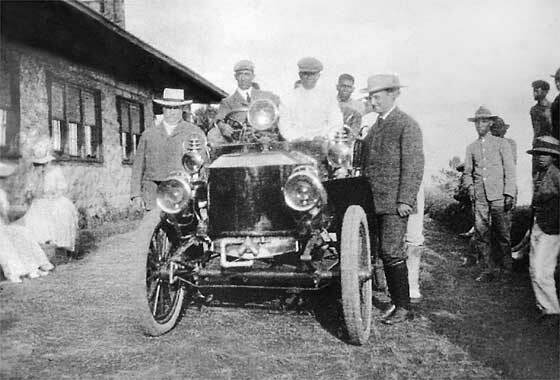 In 1908, George B. Robertson was chosen by the federal government to go to the Philippines to manage an automobile line which ran along a short mountainous government highway to the end of a short railroad leading from Manila. His official position was Supt. of automobile service for the Philippines under the bureau of posts. . . .
. . . . George B. Robertson will complete arrangements in a few days to go to the Philippine Islands for a year, for the US Gov't , to take charge of a line of Stanley Steamers, running from the end of a railway line from Manila up the mountains to Bageo, the summer capital of Luzon. Bageo is situated high up on the mountain and there the Americans in Manila find relief from the tropical and enervating climate of the capital which they require for a portion of each year, at least, or when overtaken by sickness. There is a railway running toward Bageo some twelve miles from the city of Manila. The ascent to the summer city then becomes so steep that it cannot be negotiated by a railway of the ordinary type, and no road like the mountain-climbing line up Mt. Washington has yet been built. To ascend the last 18 miles of the journey to Bageo with bullocks or mules is an all day undertaking and a tedious one at that. The sick are carried up the government road by such primitive means as were at first afforded only with the greatest difficulty. The government has built a road at much expense which zigzags up the mountains like the switch-back lines found in the Pennsylvania mining regions, only much steeper, and as one ascends there are sheer precipices frequently, beneath, and in looking down one sees sections of the road just ascended, many feet below. The Philippine commission has established an automobile line over this road and steamers have proved to be the only kind of autos that are practicable upon the route. Half a dozen steam cars are now in use there and five more, built especially for the purpose, are to be sent out at once. Mr. Robertson's position will be that of superintendent or master mechanic in charge of the automobiles on the line. The grades on the line, which ascends five or six thousand feet in 18 miles or over 300 feet to the mile, makes the operation of the cars a difficult matter, the descent being as much of a problem as the ascent. Brakes have to be specially constructed and cooled with water. Mr. Robertson will take with him an outfit of tools and machinery to be used in keeping the autos in repair. An account of his experience in the Philippines during a typhoon is in the notes for Myrtle Robertson as there was not room for the whole article here. Copyright © MMIII, Bozi Mohacek. Reproduction only by permission from the Author. All photos are strictly Copyright © by their owners.